Pure Salmon is pleased to announce that its 10,000 ton p.a. Japanese facility will be located in Mie Prefecture, part of the Kansai region on the main island of Honshu. In Japan, Pure Salmon will be known as Soul of Japan. On 18 October, executives from Soul of Japan K.K. and 8F Asset Management Pte. Ltd. visited Mie Prefecture to sign an agreement with Mie Governor Eikei Suzuki and Tsu City Mayor Yasuyuki Maeba. Total investment will be US$ 152 million for production and processing facilities and will employ 130 staff. Construction will begin in 2019 and the facility will become operational in 2021, with the first products being available from 2022. In 2017 Japan imported close to 88,000 tons of Atlantic salmon, primarily from Norway and Chile. The key difference of Soul of Japan – as with all of Pure Salmon’s facilities – is that it will be land-based, delivering a locally produced clean, healthy and fresher salmon for local consumption. Soul of Japan is actively engaging with a major local player as its strategic partner for distribution of Atlantic salmon into the domestic market. 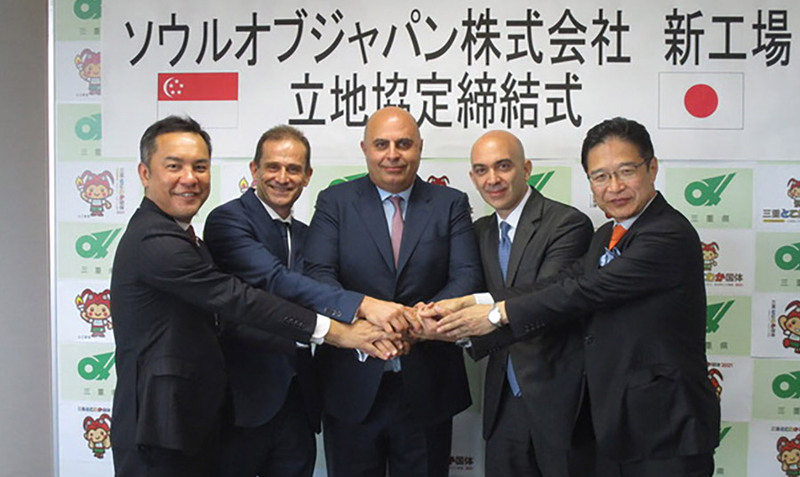 The facility will be located in Tsu city on a site of approximately 70,000m2. Mie Prefecture, host to the 2015 G7 Summit and home for Japan’s most sacred shrine Ise Jingu, was favoured because it offers an optimum combination of logistics, natural seclusion and industrial infrastructure. It is also within a reasonable delivery distance of Tokyo. Also, Mie’s progressive government and innovative approach to new and sustainable industries attracted us to the region over others.